The Queens Museum of Art introduces the work of Il Lee (b. 1952), a Korean-born artist living and working in Brooklyn since 1977. 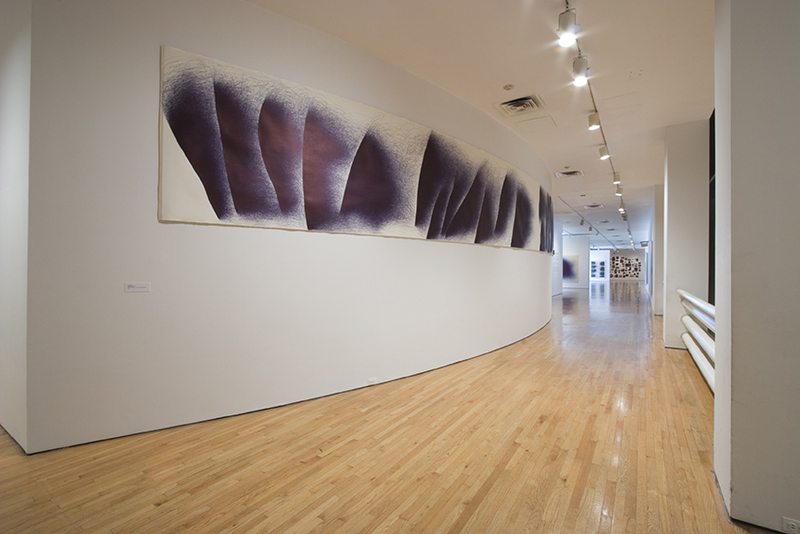 Using disposable ballpoint pens, Lee creates dramatic ink fields on surfaces of canvas and paper. For this exhibition, he will present a selection of large format blue and black ink drawings, including early experimental studies and an impressive fifty-foot installation—his largest work to date. Among other recent and historical artistic influences, Lee is largely inspired by Minimalism and the Asian practice of Sumukhwa (ink and wash painting). By combining an inclination toward austerely controlled forms with the distinctive fluidity of ink, he melds Eastern and Western cultural aesthetics into abstractions that are contemporary, yet firmly rooted in tradition. His expressive strokes—characterized by rhythmic, physically demanding arm gestures—leave behind a record of intersecting orbits, undulating lines, and frenetic swirls. When viewed en masse, these discrete movements amount to objects with monumental presence; like wide-open landscapes or perfectly preserved fossils, their auras are imposing and serene, provoking awe and inviting meditation. A palpable impression of harnessed chaos emanates from the intense voids in drawings like Untitled 901 (2001) and Untitled 978 Q (1997-98), and similarly builds from the more fragmented, starry patterns of BL-071 (2006) and BL-081 (2006). The vast power and poise of these abstract forms sends the mind in search of figurative equivalents from the natural world, but though the crests of mountains, swaths of woodlands, and the stones of a riverbed can all be found in the depths of the works, ultimately their beauty is derived from their ineffability—and the electrified mystery that surrounds them. Over several decades Lee has developed a pioneering style that has garnered him a worldwide audience. What he accomplishes with a monochromatic palate and a single, utilitarian instrument are boundless renderings that encourage different ways of seeing. Curated by Joanna Kleinberg, guest curator. Image: Courtesy of Artist and Art Projects International (API), New York. This exhibition is funded in part by New York City Department of Cultural Affairs, New York State Council on the Arts, Korean Cultural Service New York, and The Vilcek Foundation.